Ok I might have lied. No, actually I didn't. Wait.....I think I did. Ok now that, that inner battle has been won, by me of course, let me tell you a little something interesting. 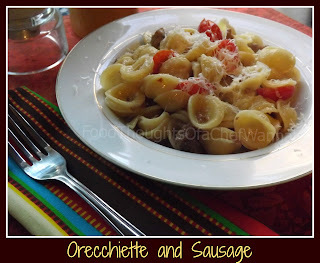 Do you know what orechhiette means? It means a small ear. I thought you might enjoy knowing that. It is a pasta typical of a region in southern Italy (where my dads mother comes from) Anyway the only real reason I told you was become some people just "couldn't bring themselves to eat witch finger cookies", wonder how those peeps are gonna like eating little ears. Cause they DO look like little ears and that color just drives home the fact you COULD be consuming, small Italian troll ears. Just pointing that out. Maybe I should be flattered, maybe my witch finger cookies really DID look that much like a real finger, you know being green and all. Anyway, I love this pasta. I have a real thing for shapes of pasta. I know it is all the same basically, I just have certain kinds I think taste better or "eat" better than others. Bucatini, and cavatappi, and ditalini rounding out my top 3. I think this has to be number 4. Yea, for sure. Now that we have covered the important issues, human appendages and pasta shapes I think we can get on with this easy, delicious crowd (even kid) pleasing, QUICK dish! This is a spicy dish, you can remove the red pepper and use sweet sausage (mild), but unless you just can't do it or hate it, I would consider it a sin. This is creamy, without having a heavy sauce, it has a fresh bite from the tomatoes and it is so yummy! In a skillet brown your sausage. When it is halfway done, add in the stock, garlic and pepper flakes. Make sure not to let your garlic burn! Stir often and let your chicken stock reduce by half. Set aside. In a large pot, boil your pasta per the package directions. Make sure you salt your pasta water and use a lot of water! Pasta needs room to groove! When it is done, drain and add back into your pot. Now take the contents of the skillet and add it to the pasta, add in grated cheese and butter, mix until combined. Dump in your halved cherry tomatoes, toss and serve! It should be beautiful creamy without any heavy sauce. If you find it a bit dry, just add some more stock and mix! Make sure to grate some extra cheese over the top, like my husband did. Enjoy this ONE pot ONE skillet dinner!